Since their advent, semiconductors have rapidly become smaller and an increasing number of functions can be achieved with them. As this evolution has progressed, Nikon has continued to develop lithography technologies with higher resolution capabilities to keep up with the ongoing miniaturization of semiconductors. With the progress of miniaturization, however, a theoretical barrier was reached that prevented existing lithography technology from handling the smaller sizes. The solution to this problem was Immersion Lithography Technology, which Nikon incorporated into its semiconductor lithography systems. 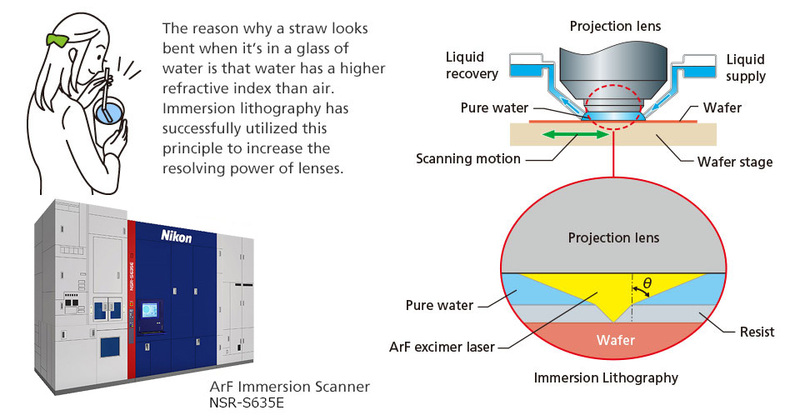 Immersion lithography achieves a higher resolving power by filling the space between the projection lens and the wafer with purified water—the refractive index of purified water is higher at 1.44 than that of air (1.00). In immersion lithography, purified water itself is used like a lens. This technology makes it possible to overcome the aforementioned barrier and fabricate semiconductors that are smaller than 40 nanometers in size. For today's leading-edge semiconductors, these semiconductor lithography systems use multiple patterning technology* to mass produce node processes less than 10 nanometers. *Multiple patterning refers to a circuit pattern that has been divided into two or more patterns with a feature density low enough to be printed with an existing semiconductor lithography system, which are then combined to ultimately render a high feature density. Semiconductors that have become highly integrated with immersion lithography technology are already being used in many electronic devices and electrical appliances, making our lives increasingly comfortable and convenient. High miniaturization of semiconductors also reduces power consumption, mitigating their burden on the global environment.